From its distinguished look to class-leading performance, the King Cobra sets the tone for a new age in scooter design. The King Cobra boasts a dynamic, modern design and incorporates cutting edge technological advancements to provide the most attractive, highest performance scooter available. No options were spared on the King Cobra, some of its great features that come standard include: an on-board USB port to charge your mobile devices, built-in cup holders to conveniently carry your beverages, digital control panel with real-time feedback, and blade style allow rims on pneumatic tires with front and rear suspension for the smoothest ride quality. 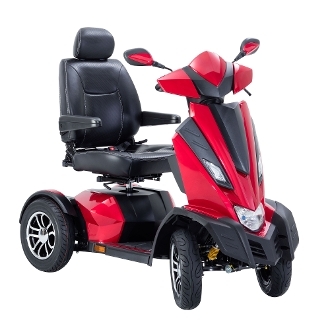 Its class-leading 11 mph top speed and 35 mile cruising range get you wherever you want to go quick! Additionally, the Sport Style Captain’s Seat is fully adjustable allowing you to tailor the seating to your specific needs. Experience the King Cobra today.